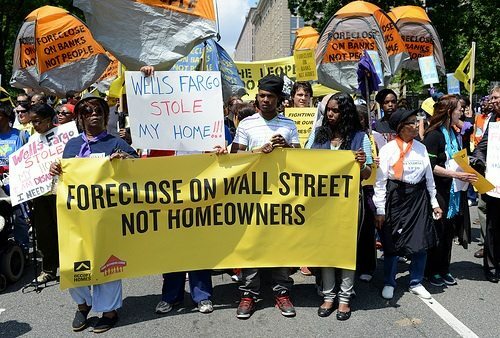 A coalition of housing advocacy groups, including the Home Defenders League and Occupy Our Homes, protested at the Department of Justice last week, calling for Attorney General Eric Holder to prosecute the bankers that caused the foreclosure crisis. (See Matt Taibbi’s “Gangster Bankers: Too Big To Jail” for more on this issue.) The protest involved 400 homeowners, many of them black and Latino, and 100 supporters. When officers moved to arrest them, several applied tasers despite the absence of violent resistance to arrest. There is video of one of these incidents involving Carmen Pittman, an activist with Occupy Our Homes in Atlanta.